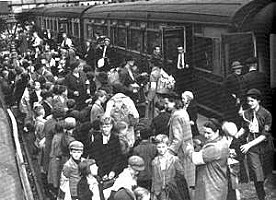 What was it like to be an evacuee? Why was evacuation introduced by the Government? Why was it important for people to be evacuated? What did they pack in their suitcases? Where were they evacuated to? When were they first evacuated? When were they evacuated again? How many people were evacuated during the war? The British government was worried that a new war might begin when Hitler came to power in 1933. They were afraid that British cities and towns would be targets for bombing raids by aircraft. Evacuation tried to ensure the safety of young children from the cities that were considered to be in danger of German bombing - London, Coventry, Birmingham, Portsmouth etc. A further two million or so more wealthy individuals evacuated 'privately', some settling in hotels for the duration and several thousands travelling to Canada, the United States, South Africa, Australia and the Caribbean. What clothes did children take with them? What else did they pack in their suitcases? To smaller towns and villages in the countryside. Some children were sent to stay with relatives outside in the countryside, but others were sent to live with complete strangers. Billeting officers were responsible for helping to find homes for the evacuees. Householders in the country who billeted (housed) city children were given money by the government. At 11.07am on Thursday 31st August 1939 the order was given to evacuate forthwith. 1.5 Million children, pregnant women and other vulnerable people such as the disabled, evacuated to safer countryside locations in just two days. 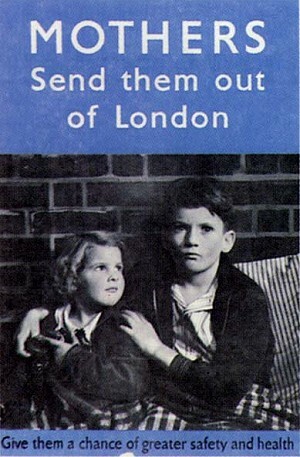 There were no big bombing raids on Britain in the first months of the war (know as The Phoney War) as a result by early 1940 many children had returned home. They were evacuated again when heavy bombing raids started in the autumn of 1940 - The Blitz - and then again later, in 1944, when Germany attacked Britain with V1 Flying Bombs and V2 rockets. By the end of the Second World War around 3.5 million people, mainly children had experienced evacuation. No one was forced to go but parents were encouraged by posters and told that their children would be safer from German bombs if they moved to the country. What was it like for a child to be evacuated? Being an evacuee must have been scary and exciting at the same time. The children had to leave their families and homes behind and try to fit in with host families in the country. Children had labels attached to them, as though they were parcels. They stood at railway stations not knowing where they were going nor if they would be split from brothers and sisters who had gathered with them. They felt scared about being away from their families but also excited about going to a place they had never seen before and only read about in books. The children arrived in the countryside, tired, hungry and uncertain whether they would ever see their families again. They were taken to the village hall, where they would be met by the billeting officer (the person in charge of finding them homes). A 'pick-you-own evacuee' sessions would then take place, where host families (the people they were going to live with) haggled over the most presentable children while the sicklier and grubbier children were left until last. What do you think were the advantages and disadvantages of being evacuated? The children who were evacuated to the country were evacuees. Their letters tell us a lot about what life was like for them. The children at Compton Primary School in Plymouth have written letters summing up perfectly how evacuees must have felt. These extracts from letters sent by a mum to a girl called Delia, who was evacuated from London to the country. Ruth writes about how she imagines it was like to be evacuated. Billeting officer A person whose job was to find suitable houses in all areas that were receiving evacuees.